**Some remarkable past LIVE SAND ANIMATION SHOW by Sand Artist BADAL BARAI …..
DOHA, QATAR, 5 year celebration of Qatar Govt. **Live Sand Art by Sand Artist Badal Barai at Sheraton Grand Doha Resort & Convention Hotel, QATAR , Celebration of four years development of QATAR Government in presence of Eminent Business representatives from Qatar and other countries along with ministers of the Government of QATAR on 24th of june , 2018 . Proud to be part of the Programme in Doha, Qatar. The images of the famous monuments of Qatar, the FIFA world cup 2022 which is to be held in Qatar and the portrait of HH Sheikh Tamim Bin Hamad Al Thani, the Emir of Qatar were created live with sand art. ** Save Water Sand Art at Jaipur Exhibition and Convention Centre (JECC), Rally for Rivers.15000+ Audience and Presence of Vasundhara Raje, honourable CM, Rajasthan and Sadguru Ji at Jaipur Exhibition Convension Centre (JECC) on 28th of July , 2017. Proud to be part of the Programme for Water and River Conservation Project (Rally For Rivers)…organised by Department of Tourism, Govt. of Rajasthan and ISHA Foundation. An sprcial sand art story was depicted through live sand art by Sand Artist Badal Barai. Live Sand Art by Sand Artist Badal Barai for 5th International University Volunteer Youth Forum on 25th of October, 2018 at Qatar University, Doha, Qatar. The programme was bigger with participants from different countries from around the MENA Region and the world. The live Sand Art was there alongwith a drama played by the students of the university on WAR and Peace. The theme was ” If anybody serves the society selflessly, he or she must gets the return from the society even when he or she is not present in the world. ** Annual Day Celebration of Qatar national Bank (QNB) at Sheraton Grand, Doha Qatar on 15th of January, 2019. The history QNB alongwith the skyline of Doha was shown through live sand art with a background music played by live JAZZ Band came for France. Raising Day Celebration of Coast Guard Army at Coast Guard Army Head Quarter Ground , Port Blair Andaman on 1st of February, 2019. The live Sand Art show by Sand Artist Badal Barai was on the theme song of Coast Guard Army. There was another live performance by the sand artist on diversity of India. Some captured moments at BALADNA PARK, QATAR during sand art show by Sand Artist Badal Barai for BALADNA Annual DAY on theme of awareness about Cancer..organised in collaboration of BALADNA and QATAR CANCER SOCIETY on 22nd february, 2019. Baladna is the largest milk product producing company in Qatar. It has two factories in Qatar. The programme was in one of them. Amazingly managed environment. Nobody will believe that the factory with 24000+ cows and all amenities along with the beautiful park and well decorated restaurant is just on the desert , far away from the city area. Live Sand Art at KATARA HALL, DOHA Qatar in the ocassion of Annual Employee meet 2019 of Dandy , one of the largest Dairy product, chokolet and ice cream manufacturer in Qatar. Company journey of Dandy pre and post BLOCKED period were presented through live sand animation art by Sand Artist Badal Barai. ** Save Water Sand Art at Swai Man Singh Stadium Ground , Jaipur on 18th of December, 2017. Proud to be part of the Programme for Celebration of Four Years Completion of Govt. of Rajasthan with special emphasise on Swachh Bharat Mission and Mukhmantri Jal Swabalamban Abhiyan…organised by D.M. office, Jaipur, Rajasthan. Exellent response from the viewers in MUMBAI. The sand story was on CSR activities on sustainable development by the Multinational Company ROQUETTE, which has a global presence in more than 100 countries and which is operating in India on Corn based products. The live show in the Hotel WESTIN , mumbai. 13th and 14th Dec, 2018. ** Sand Art at FORT WILLIAM, Kolkata on 22nd july, 2017, Retirement of General Praveen Bakshi, Eastern Command. The Life Journey of General Praveen Bakshi, Eastern Command was depicted through a beautiful sand art story. ** Live Corporate Sand Art at Hyatt Regency, Pune by Sand Artist Badal Barai in the occasion of Celebration of Partnership between ICI and HUNTSMAN on 2nd November, 2018. Thanks for the huge response from the lovely audiance in the BENGALURU at the 10th year Celebration of collaboration between ACCENTURE and MERCK organised by MACH -1 at Manipal Conty, Bengaluru . The corporate sand art story was on collaboration between ACCENTURE and MERCK and also on the organisational structure and business process of MERCK. 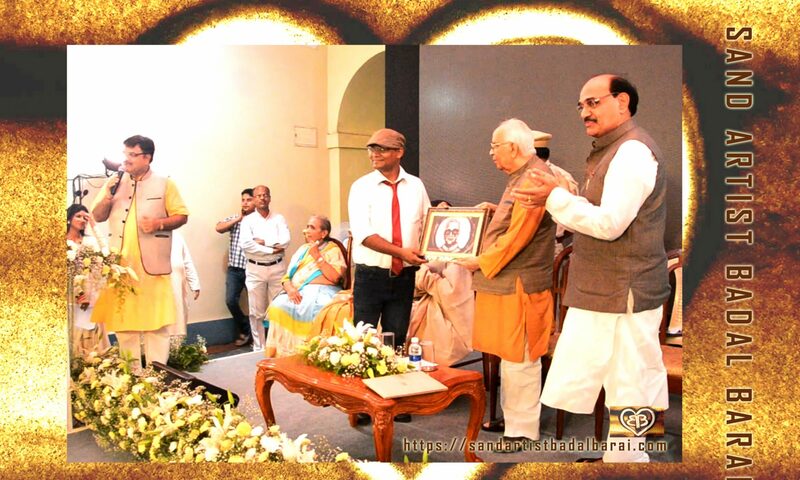 ** Live Sand Animation at Rajbhavan, Kolkata in presence of Hon’ble Governor, WB Shri Keshari Nath Tripathi on 17th July, 2018. The live Sand Art Show was on the Theme of ‘BETI PADHAO ABHIYAAN, GAU SEWA, SKILL DEVELOPMENT’ and with Patriotic Song ‘We Shall overcome’. The show was a part of Company Social Responsibility activities of SKIPPER FOUNDATION where a postage stamp was launched and 1200+ girl students were financially helped for their education. **Live Sand Art at Delhi CR Park in the Occassion of POUS MELA on 14th of January, 2018. The Live Sand Art show was on the Song of Banasree Sengupta sung by her sister Mahua Mukherjee and on Poem by Sovon Sundar Basu. The live show was for the Bengali Community lives in Delhi and they were about 5,000 in numbers. ** Live Sand Art at J.W Marriott , INDORE on 22nd January, 2018 for Corporate meet of Dealers and Official Executives of Multinational Company LIUGONG, the largest manufacturer of Wheel Loader based from CHINA. Silver Jubilee Marriage Anniversary of famous Dimond Merchant in Indore. The past 25 years memorable events were depicted throuhg live sand animation. Family, House, Business, Travel, Children everything was covered in the sand story. ** Live Sand Art Show at CTS, Jaipur, Rajasthan on the Occasion of NATIONAL VOTERS DAY on 25th of January, 2018 organised by DM Office , Jaipur in association with Election Commission , INDIA. ** Live sand art on the Grand Celebration of 125 Years raising day of FORT WILLIAM, KOLKATA. the 125 years story, the Palassey Battle, Sipahi Battle, Construction of Fort William Building and more were depicted through live sand art along with an amazing voice over depicting the real story to recreate the history of the heritage place. ** Live Sand Art for Golden Jubilee of 59, Army Engineering Regiment at Yol Camp, Dharamsala, Himachal Pradesh. 50 years glory was depicted in the occassion along with live sand art. ** Live Sand Art for Central Vigilance Commission, India and MCL on Golden Beach, PURI on 05.10.2018. The Sand story was on Honesty and Anti Corruption Movement. The Golden Beach was crowed with 3500+ viewers. ** Live Sand Art for ISKCON (International Society for Krishna Consciousness) at Biswa Bangla Convention Centre, Newtown, Kolkata on the occasion of Janmastami on 02.09.2018. The whole story of Lord Krishna from birth to Raas Lila were presented through Live Sand Art with melodious background music, songs and voice over. The auditorium was full of about 600+ viewe. Golden Jubilee Marriage Anniversary of famous Industrialist of BIHAR. The past 50 years memorable events were depicted through live sand animation. Family, House, Business, Travel, Children everything was covered in the sand story. The Golden Jubilee marriage anniversary was organised at famous and Popular Resort “SWASTI” just beside the CHILKA Lake on 30th December, 2018. ** Live Corporate Sand Art for Corporate Meet of Dealers of TATA STEEL at the CERIBRUM HALL, Vedic Village, Rajarhat, Kolkata on 18th of January, 2018. There was a brand launch of TATA AGGERTO and the theme was Sustainable Development . ** Live CORPORATE SAND ART show by Sand Artist Badal Barai at Le Meridien, New Delhi on the occasion of Corporate Dealers Meet of East Coast Pvt. Ltd. for the promotion of brand ROXX on 18th of August, 2018. A sand story was created with recorded background voice over on the journey of the East Coast Pvt. Ltd along with the brand ROXX, imported glass product.